Quick and easy to install prior to pouring the basement floor. Continuous drainage channel at wall-floor joint is barely noticeable in finished basement. Designed to work with any sump pump system. 20-year dry basement warranty backed by Basement Systems. Home buyers expect a dry basement. But if leaks in the foundation occur, fixing them costs you in three ways: time, money and reputation. CactusBoard II is an affordable and effective interior drainage system that is easily installed during the construction of the foundation. The CactusBoard II is something you can finally count on to keep the basement dry. Exterior footing drains and foundation coatings provide an important first line of defense against basement flooding. But because hydrostatic pressure can force a high volume of water through even the smallest gaps and cracks in the foundation, you need an effective interior drainage system to provide failsafe protection –a final line of defense to keep the basement dry. This is where CastusBoard II comes into play. 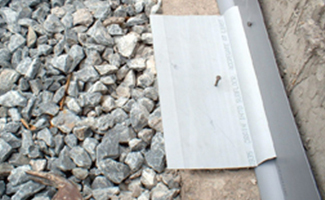 Made from indestructible, high-density PVC, CactusBoard II drainage molding is designed to be installed on top of the foundation wall footing and against the foundation wall. The installation is completed prior to pouring the basement floor. 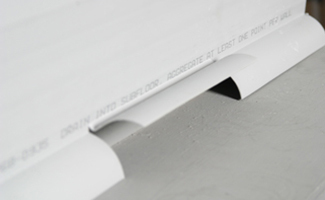 The innovative design of the CactusBoard II molding provides a drainage channel for all foundation wall leaks, whether the leak occurs because of cracks, form ties, flooded window wells or pipe penetrations. 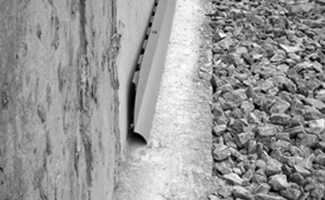 All of these leakage points are captured by a continuous drainage channel along the base perimeter of the wall. The molding also provides a drain line for ground water forced up along the wall-floor joint by hydrostatic pressure. To create a drainage outlet that conveys water to a sump pump, you simply cut an opening in the vertical molding and install a short horizontal piece to extend over the footing near the sump pump location. It’s that simple. As easy as 1-2-3. It doesn’t take long to install CactusBoard II drainage molding around the perimeter of the basement and best of all you can eliminate all those wet basement callbacks. Step 1: Tack the PVC molding in place on top of the footing and against the wall. Built-in standoff struts create a gap to capture all wall leaks. Step 2: Cut a flap in the molding to expose the drainage channel wherever you want water to drain into the subfloor aggregate (near a planned sump pump location, for example). 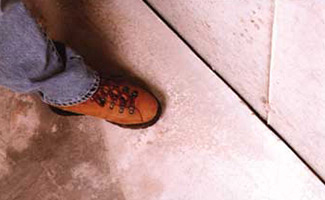 Tack a short length of molding horizontally so that water can drain across the footing into the subfloor aggregate. The only trace of the CactusBoard II drainage system is a small, uniform gap between basement walls and floor.